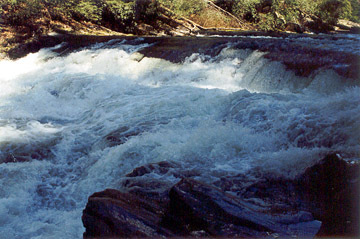 Big Bend Falls are the largest cascade on the Chattooga River at 25 to 35 feet. This monster would be a kayaker's dream (or nightmare) if they were allowed to run on this section of the river. Follow the white-blazed Foothills Trail (FT) from the Burrells Ford Road trailhead about .5 miles to a bridge over Kings Creek. A few minutes after crossing that bridge, the black-blazed Chattooga Trail (CT) will join the FT from the right. Follow the combined FT/CT trails for another three miles or so. 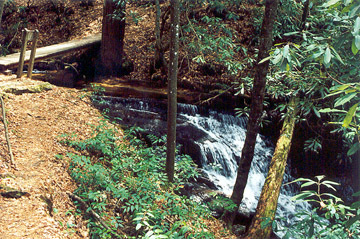 You are about .5 mile away from Big Bend Falls when you cross a creek on an open bridge at the top of a small, unnamed waterfall (pictured below). 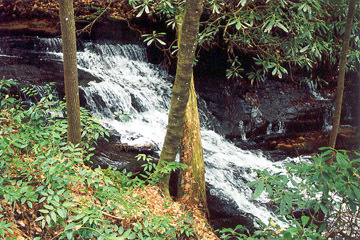 On the south side of the bridge, the slightly longer Big Bend Trail from the US Forest Service's Cherry Hill Campground on SC 107 connects to the combined Foothills and Chattooga Trails. 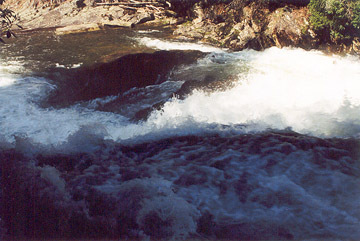 As you near Big Bend Falls, you will hear its deafening roar. The hard part is in the final few yards for you must descend the slick river bank to get a clear view. 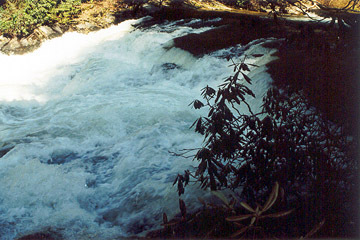 On my visit, the water was up and I could not get downstream to get a frontal view of the falls. I had to make do with a side view until my next visit. Directions: From Walhalla, take SC 28 north to SC 107. Turn right onto SC 107 and follow for 17 miles to Forest Service road 708 (Burrells Ford Road). Proceed down FS 708 for 2.6 miles. Park in the campground parking lot on the left (look for the bathroom). 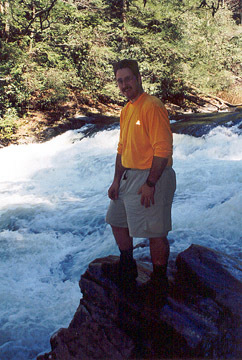 If you cross the bridge over the Chattooga, you've gone too far. 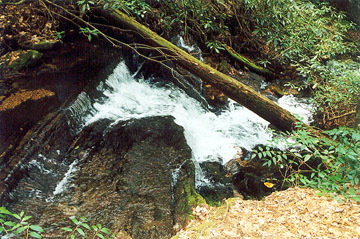 Follow the Foothills Trail downstream to Big Bend Falls.